The Vatican will issue two new postage stamps on November 23, 2017, the Holy See Press Office announced October 31, 2017. 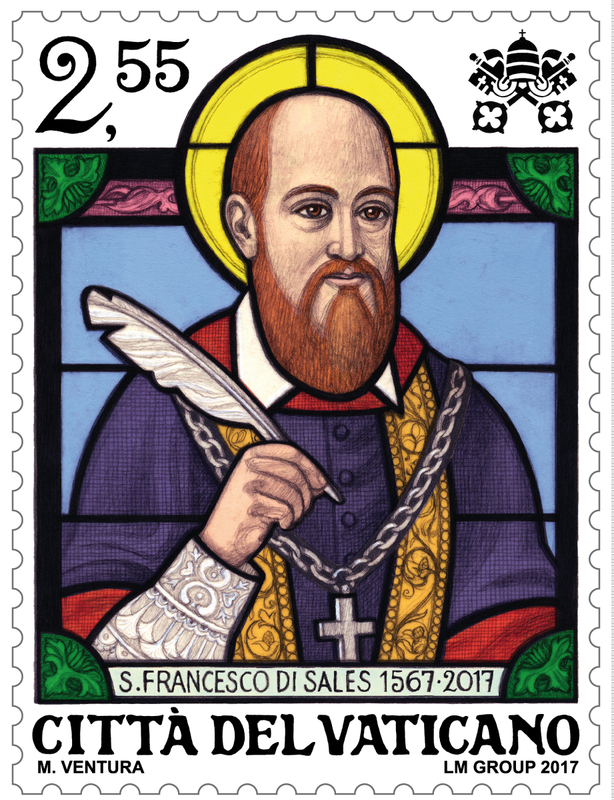 A 2.55-euro stamp celebrates the 450th Anniversary of the birth of Saint Francis de Sales. A 1.00-euro stamp marks the October 31, 2017, 500th anniversary of the Protestant Reformation. Saint Francis de Sales was born in the French border town of Thorens-Glières on August 21, 1567, of an ancient and noble heritage At a young age, Francis de Sales showed interest in theology during his formative years of study that soon led him to a vocation to the priesthood. He carried out his ministry with the firm desire to safeguard the Church of Rome from the reform of Calvin. Saint Francis de Sales, Doctor of the Church, is one of the fathers of modern spirituality and influenced the most important figures of the 1600s in Europe. He brought back many faithful separated from the Catholic Church by speaking about the love of God. Many religious congregations took inspiration from him, including the Salesian Family founded by Saint John Bosco, who chose him as patron of his efforts, both because he was one of the most venerated Saints in the Piedmont region of Italy, and because he incarnated the principles of loving kindness, optimism and Christian humanism that became the foundation of the teaching methods of don Bosco. Francis de Sales was beatified in 1662, and canonized by Pope Alexander VII just three years later. Marco Ventura portrays him in the style of an antique stained glass window, with his pen in hand, since he is patron of journalists and writers. “All of us are well aware”, Pope Francis affirmed on another occasion, “that the past cannot be changed. Yet today…it is possible to engage in a purification of memory”, without “resentment” that “distorts”. The Vatican’s Philatelic and Numismatic Office is responsible for issuing Vatican postal stamps and euro coins. The office was established in 1929, issuing its first stamps that year featuring the image of Pope Pius XI.